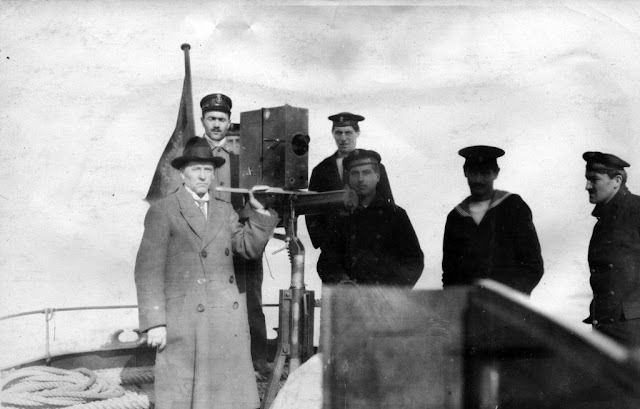 In November 1915, American cinematographer Frank E. Kleinschmidt traveled to Trieste where he filmed the operations of the Austrian navy. From Trieste Kleinschmidt flew on a military expedition to the Italian coast and covered a mine-sweeping trip across the Adriatic Sea. Both his film report and a written account on his extraordinary experiences with the Austrian sailors have been preserved. Kleinschmidt's film adventures during World War I have been described in more detail in our book American Cinematographers in the Great War. He was in 1915 the only neutral American cameraman to film a submarine in action and fly above the Balkan front, taking motion pictures of the attack by the Central Powers on the Serbian capital, Belgrade. Kleinschmidt’s camera also recorded some stunning scenes of actual fighting in the trenches on the Eastern Front. Kleinschmidt's film War on Three Fronts (USA, 1916) has a scene picturing the seaplane he was in, taking off on a scouting trip from Trieste. Shortly afterwards he accompanied a mine-sweeping operation three miles off the Italian coast. 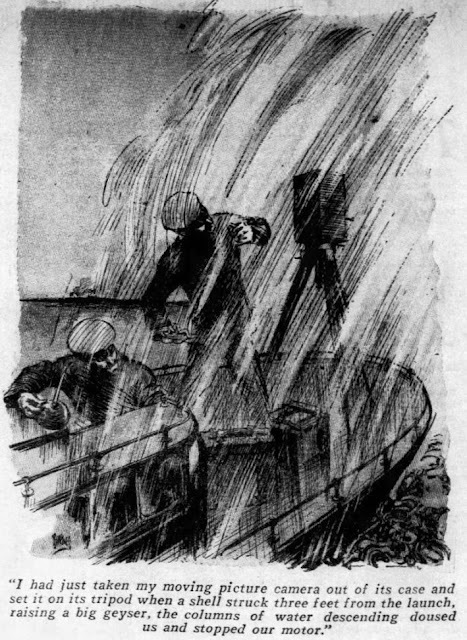 A small flotilla of barges and tugboats was sent out under cover of fog, with only a 75-mm Hotchkiss gun at the bow to protect them against the Italian navy. It was extremely dangerous work. The Austrians were instructed to bomb their own ships as a last line of defence, in case they were under attack. As is shown in his film, the mines were inspected under water with the aid of a special tube and carefully hoisted from the sea. Unfortunately, the remaining footage of War on Three Fronts has no scenes showing their escape across the Adriatic but the film does have the scenes showing how the mines were lifted out of the water. For a copy of Kleinschmidt's complete report (originally published in Scientific American under the title "A Sea Fight in the Adriatic" on July 14, 1917) check out this link. Here you can see a collection of pictures on Kleinschmidt and his fascinating war film. In April 2017 authors Cooper Graham and Jim Castellan will host a show of Reel America on American History TV. The show is set to commemorate the centennial of America's entry into World War I and will be broadcasted nationwide through C-SPAN3's service which is available throughout the United States in 49 million digital cable TV households. On Reel America each weekend archival film is shown that relates to C-SPAN's mission of politics and public affairs. Cable network C-SPAN in 2011 expanded its programs with a new history-based service, airing weekends on C-SPAN3. "American History TV" features programming geared toward history lovers with 48 hours every weekend of people and events that document the American story. For this special episode Cooper and Jim will comment on Wilbur H. Durborough's historic World War I film On the Firing Line with the Germans (USA,1915)) which has been restored recently by the Library of Congress. 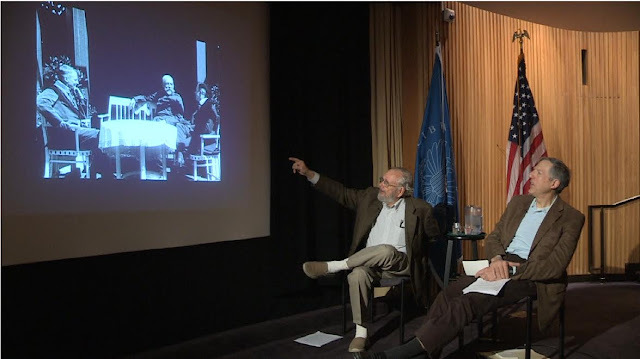 While the film is being shown they will provide the audience historical insight and context to the silent film, based on their research of Durborough and his film which enabled the Library of Congress to reconstruct this lost film. This show is also a must-see if you are interested in watching the experiences of an American cameraman in wartime Europe while covering the offensive of the German army on the Eastern Front. Cooper and Jim will be joined in this program by George Willeman and Lynanne Schweighofer from the staff of the Library of Congress, who have been instrumental in restoring Durborough's film. The program will debut April 15 at 10pm and April 16 at 4pm ET on C-SPAN3’s American History TV. The show will also be streamed online on C-SPAN's website which has an extensive video library. We will keep you posted on this TV show. For the TV schedule of this show check out this link to C-SPAN's website. Here is a trailer on C-SPAN3's history show with scenes from Durborough's war film. On February 7, 1915, photographer Edwin F. Weigle left Chicago for a six month trip to Europe. Assigned by the Chicago Tribune to film the Great War, he visited the Western Front and covered the offensive of the Austro-German army in Russian Poland, as well as the opening rounds of the war around Lake Garda in Italy. His experiences in Italy have been described in a previous weblog. 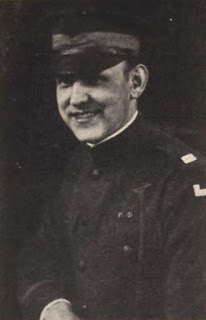 Weigle returned to America in August 1915. The films that he shot were edited into The German Side of the War, a movie that turned out to be so successful that he was soon sent back to Europe by the Chicago Tribune to produce a sequel. Weigle's war film, as well as his experiences during World War I, have been described in more detail in our book American Cinematographers in the Great War. As a result of this trip to Europe, Weigle wrote a report which was published in 1915 as a 27 page booklet under the title On Four Battlefronts with the German Army. The booklet is hard to find nowadays, even in research libraries, but we managed to locate a copy in the World War I Library in Stuttgart, Germany, and because of its historical value have uploaded Weigle's report to this weblog. Weigle's story can be read and downloaded here. 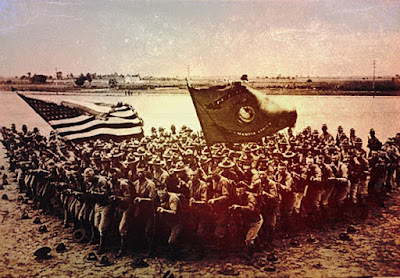 To commemorate the centennial of America's entry into the First World War C-SPAN3 on "American History TV" recently broadcasted the silent film America Goes Over. This vintage five-reel film provides us with a fascinating example how the Great War was shown on the American movie screen. There is a great deal of ambiguity surrounding America Goes Over because actually two versions of the film were produced. The original film was produced shortly after the Armistice in November 1918 by the Commitee on Public Information (CPI), America's wartime propaganda agency. The first reel of this film version mentions the CPI and judging from the opening titles appears to have been used mainly as a complilation movie for distribution both in the United States and abroad. Apart from scenes taken by military cameramen of the U.S. Signal Corps this first reel of the film also has footage supplied by other Allied countries. The original CPI version of America Goes Over can be watched here on YouTube. In 1927, ten years after the United States had entered World War I, there was a new release of this movie. The U.S. Signal Corps had struck a deal with the Eastman Kodak Company and the original footage was now printed on 16 mm safety stock, which made it possible to distribute the war film directly to customers as a home movie. Apart from the complete five reel film, the customer could also order a separate segment from this historical film. The first reel of this 16 mm version is quite different from the original film which had been released by the CPI nine years earlier. Most of the propaganda content was cut out of the opening intertitles and many scenes not related to the American theater of war in France were deleted. On December 31, 2016, C-SPAN3 first aired this 1927 home movie version of America Goes Over nationwide in the United States. 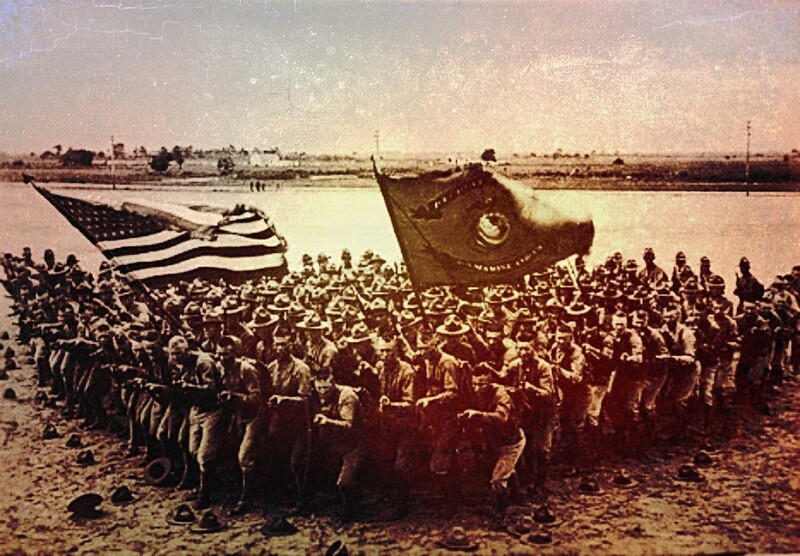 The footage comes from the National Archives in Washington, D.C. and despite the fact that the film is almost one hundred years old the quality of these pictures is astounding. As the film is being shown historians Mitchell Yockelson and Allison Finkelstein provide comments on America's entry into the First World War, both on the political and the military stage. We have uploaded C-SPAN's showing of America Goes Over to our YouTube channel. 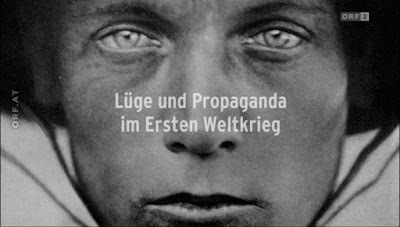 During World War I film for the first time was used as a medium for mass propaganda. But how were these images constructed and exploited for publicity purposes? In June 2014, the Austrian TV documentary Macht der Bilder showed how this was done in the Austro-Hungarian Monarchy. The TV program, broadcasted by ORF2, is interesting for several reasons. 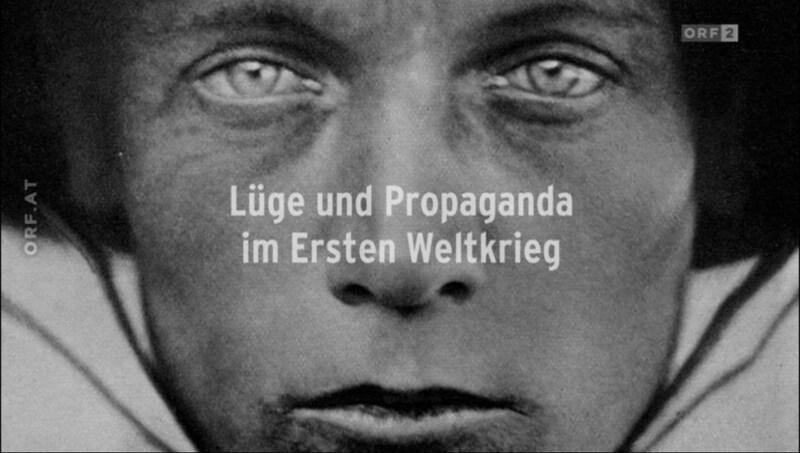 Most of the World War I footage that was used for this documentary comes from the Austrian Film Museum which has an excellent collection of contemporary film. An analysis of the footage reveals how war scenes sometimes were staged before the camera. Also, although not credited in the TV program, there are some scenes here that were shot by American cinematographers who accompanied the Austro-Hungarian army during the First World War, notably Frank E. Kleinschmidt and Albert K. Dawson. Parts of the TV program have been uploaded on our YouTube channel, including film scenes showing the battle for Przemyśl on the Eastern Front in the summer of 1915. Some of the footage on Przemyśl was found in a German archive, but during our research for our book American Cinematographers in the Great War we also located these films, shot by Albert K. Dawson, in the collection of the Library of Congress in Culpeper, Virginia.